As we enter winter 2018 it seems appropriate to add a bit more winter to Robo Instructus’ frozen world. So this week’s alpha-1.20 brings snow. 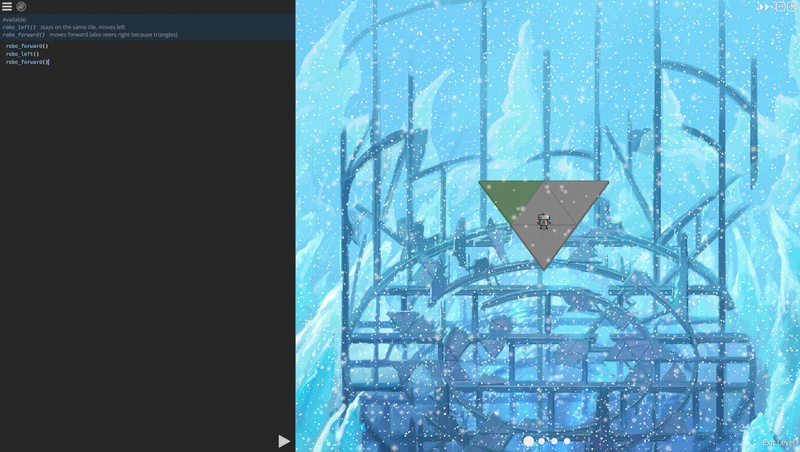 The snow effects are implemented fully in the fragment shader. There are foreground and background snow layers, each of which move in a parallax style as the view changes. I’ve made the speed of the snow reflects the game speed, which provides a nice additional visual clue when you change the speed and also when your code has stopped / paused. At the same time I’ve tried to ensure the effect runs well on weak hardware like onboard GPUs. The point of effects like these is to go hand in hand with the other art & music boosting the take-game-seriously factor which is particularly important for first impressions. Right now this is my first go at the snow and I’ll probably end up reworking it somehow. With the world even whiter than before there are already some issues with UI visibility. Some of the early levels have added requirements beyond simply traversing them. Players need to solve them with particular code, to demonstrate they understand the code usage somewhat. 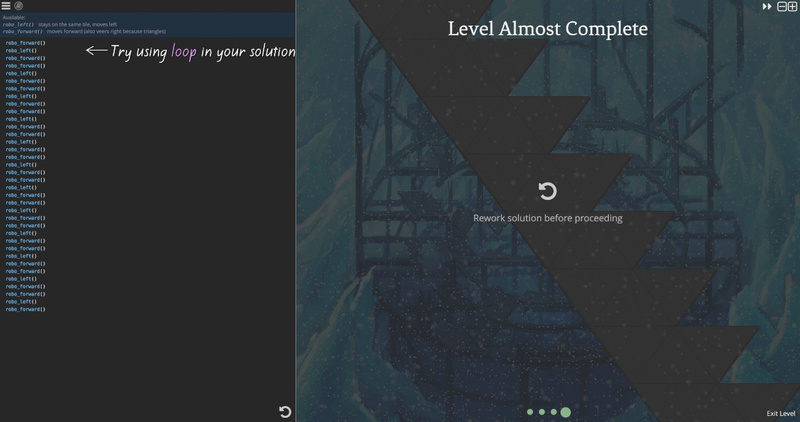 The current releases still showed the “Level Complete” screen after finishing even if these requirements had not been met. This changes with alpha-1.20 to provide more clarity to players that they must rework this level before continuing. I went with “Level Almost Complete” as an attempt at positivity, clear enough? These requirements are limited to early levels, as generally the game doesn’t care how you solve the level just that you did. So though your code performance stats may be poor, crap code is fine as long as it works. The early level exception is purely about learning how to code, once demonstrated you can rework the solution back to a more primitive version.